Do you remember meeting your in-laws for the first time? I was a nervous wreck! Mr DIY and I had been dating for a couple years, and we were getting serious. Trouble was, his folks lived in New Jersey and mine were in British Columbia...yeah, Canada. And we were attending College somewhere in the middle. So having dinner with the folks wasn't really feasible. The summer before we got married, I flew out to meet his family and spend a week with them! You know, meet them, hope we hit it off and spend a week. No pressure! I had heard about how much my future f-i-l loved Coca Cola and M&M's...so before meeting him, we stopped by Costco and I bought a giant bag of M&M's and a big bottle of Coca Cola. Armed and ready, we walked in the house. Imagine my relief when Mr DIY's dad welcomed me with a big smile and crushed me in a giant bear hug! Whew, passed the test!! And his mom was just as sweet and friendly. I have now been a member of the Long clan for over 23 years and I promise you, I have the best in-laws! Period! I doubt anyone has influenced my love of farmhouse decor and collecting more than my in-laws, who are both avid collectors. My father-in-law has an impressive vintage Coca Cola memorabilia collection, and my mother-in-law collects nativities from around the world (her current collection is 500+ and still growing! ). Their home has always been a 'wonderland of treasures' and I love the cozy, warm feel that their collections add to their home. And while I could tell you a million stories of being in the Long family (there was that week we spent at White Lake...) I need to get back to my Coca Cola tree! The Coca Cola tree probably makes sense now! And with the family coming for Thanksgiving this year, I thought it would be fun to have the tree all decorated and on display...even though the rest of the house is still decorated for Thanksgiving - ah well - eclectic, right?! Affiliate links are provided for your convenience. You can find my full disclosure policy here. Many of the ornaments came from Kohl's after-Christmas sale last year. Fluffy polar bears and vintage Santas with bottle-brush trees were too difficult to resist. I paired them with my little flocked tree, which you may not recognize. Last year it was decorated with nature-inspired ornaments including bird's nests. I found and purchased the tree last year from the thrift store, even though it had a broken stand. My easy solution for the broken stand was a success and so I used it again this year! I wrapped the base with a drop cloth remnant, and tied it off with a big polka dot burlap bow. A little fake snow (aka fluffy white dust cloths from the dollar store) and a red burlap garland help to add a festive, wintry touch and fill in some of the holes. And those fabulous monogrammed ornaments that I've hung from clip rings? They were a DIY project of course! 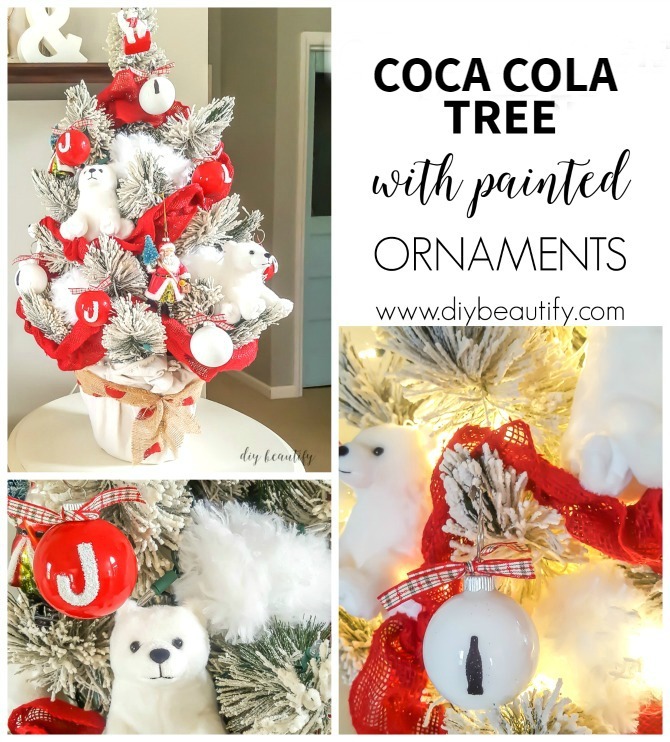 Be watching for a tutorial for the painted ornaments, including the coke bottle ornaments, coming soon! These frugal ideas can be used to decorate any themed tree! What do you collect? Have you ever hung your collection on a Christmas tree? Pretty much anything can be tied with a bow and hung or clipped onto a branch...or tucked into the tree limbs if it's not breakable! If you're stuck in a tree-decorating-rut, I am giving you permission to break free and decorate a Christmas tree just for fun! Why not a Coca Cola Christmas tree this year? !